This expanded steel table with rolled edges will pleasantly accentuate your outdoor setting. 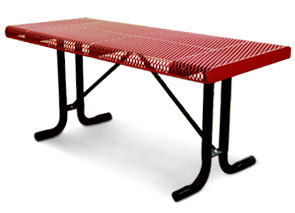 The table top is thermoplastic coated for all weather durability and has rolled edges for a continuous, smooth look. 2-3/8" O.D. legs are powder-coated for superior strength and durability. Table top is available in the colors shown below in a lightly textured matte Polyethylene finish. Table comes without seats, especially designed for buffet style picnics.